WASHINGTON — Israel vowed it would respond in kind after Hamas militants kidnapped, then killed, three Israeli teenage boys on their way home in the West Bank. Hamas, which has joined with the Palestinian Authority to form a so-called “unity” government for the Palestinian people, praised the killings but said it was not involved. The teenagers, according to The New York Post, were kidnapped two weeks ago and were only recently found by a search party. They were buried in a shallow grave. 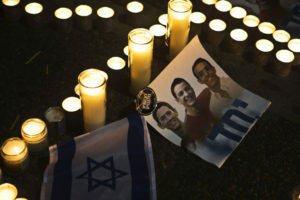 The boys, Eyal Yifrah, 19, Gilad Shaar, 16, and Naftali Fraenkel, a 16-year-old who has dual U.S.-Israeli citizenship, were to be buried in the city of Modiin today. About 400 Hamas militants were arrested in sweeping raids by the Israeli military. Around 34 air strikes hit targets in the Gaza Strip where Hamas rules the Palestinian people. The air strikes were in response to about 18 rockets being launched into Israeli territory from Gaza. The two main suspects, Hamas militants Marwan Qawasmeh and Amer Abu Aisheh, have not been seen since the teens’ kidnapping. U.S. President Barack Obama extended his condolences and offered “full support and friendship” of the U.S, as the Jerusalem Post reported. He also asked for cooperation from the Palestinian Authority. State Department spokeswoman Jen Psaki urged caution on part of the Israeli government in their search for the suspected murderers. Accuracy in MediaBarack ObamaBenjamin NetanyahuGaza StripHamasIsraelJen PsakiPalestinian AuthorityU.S.